As the semester passes and your chapter meetings are underway, you may notice your meeting attendance begin to dwindle. Why? As the president of the North Carolina A&T State University MANRRS chapter, I found myself asking this question among many others. Why is my attendance declining with each meeting? Why are the students not interested in coming anymore? What should I do differently to stop this from happening? 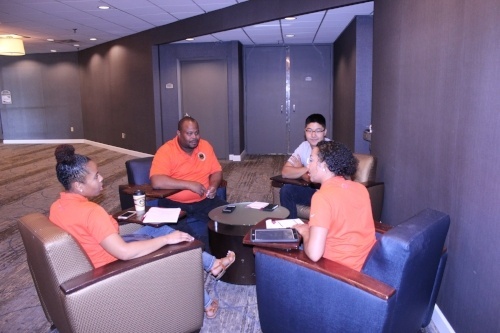 As I began to consult with our chapter advisor, and my executive board, it all became clear. With these three steps, losing attendance and members will be an issue of the past. Plan something to look forward to each month. Whether it’s a fun new volunteering experience to look forward to or a professional development workshop, the students and members of your MANRRS Chapter want something to work towards. People love that feeling of participation and development, so scheduling at least 2 events per month will allow students to feel as though their membership is valued. Only your members know why they choose not to come to meetings. The best way to find out the truth about what you are doing wrong is to simply ask the students. Whether it’s as simple as a scheduling conflict or something a little more serious such as poor organization or poor communication, you can trust your members to be as honest as possible with you. This is a sure fire way to really learn what it is they want from their leaders. Contests are always fun, right? Invite your members to bring a friend, and the member who brings the most friends at the end of the month wins a prize, a gift card, etc. The member who has that “perfect” attendance at the end of the semester can win something as well. There’s no limit to the creativity involved in developing a contest. As long as it gets current and potential members through the door. Retaining members is a hassle that all organization leaders face throughout the year. Competing with fashion shows and homecoming is a feat! But remember, you’re not alone. Try these tricks out and watch your membership flourish.